I heard about ‘Malice’ from John Jarrold – he let me know that this novel was the closest thing he’d ever read to A Song of Ice and Fire, so I was intently interested as soon as I heard that. Being a massive fan of Mr. Martin, I thought the claim was bold and perhaps a bit too much, but considering John Jarrold’s stature in Genre Fiction I knew that he hadn’t meant it literally. So I managed to secure an ARC for myself through Julie Crisp and Laura Hammond, and settled in to read it. 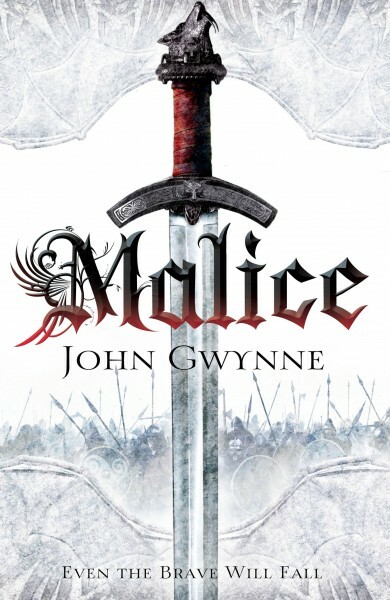 I agree with John – Malice (the first book in The Faithful and the Fallen) is definitely an epic that fans of A Song of Ice and Fire will enjoy! The Banished Lands has been witness to war (between humankind, giant-kind and vastly powerful supernatural entities) of such ferocity that even the principal creator-god of human- and giant-kind has turned his back on his creations. Humans are spread across The Banished Lands, living uneasily with each other and constantly defending against attacks and raids by the remaining giants, who were once united but are now fractured into various clans. Among the humans and giants, forces are at work that seek to tip the difficult peace into all-out war, and when the novel opens, various characters find themselves at the beginning of journeys that will force them to choose sides in the conflict. We meet Corban, not yet a man, struggling against bullies, terrified of his anger, and keenly sensitive; his sister, Cywen, apprenticed to a stable-master; the stable-master himself; Veradis, brother to a respected and valued warrior and son to a very difficult man; Evnis, advisor to King Brenin; Kastell, whose family was killed by giants; Nathair, a prince who keenly feels the weight of his destiny – and plenty of others, connected or not. The first strength of the book is the easy-to-read writing style – John keeps things simple, giving out information about the characters and the world in a way that doesn’t bog down the narrative, and even keeps the chapters short and sharp, titling these chapters with character-names so that the reader knows who he’ll be reading about next. The book’s world-building is also top-notch, in the sense that the detail and history of it grows and deepens chapter by chapter – the prologue sets the scene in terms of the encompassing conflict, and gains flavour and texture as the book continues. Magic-wise, this novel doesn’t have much to offer, neither in the use of the explanation of it, and it’s the only issue I have – it seems to me that the book could still stand strongly without magic; but that also leaves me with the hope that we get to see more and understand more about John’s particular brand of magic in the next book. Character-wise, ‘Malice’ is truly top-shelf – John writes them with a deep understanding and empathy, so that even the ‘bad’ guys don’t seem so bad, and the good guys have their own failings and troubles. My favourite character was Veradis – doing what he believes to be right and true even as he gets pulled deeper onto one side of the conflict. The same can be said of Nathair, and I hope we get view-point chapters of Nathair in book 2. Corban, the novel’s central character, showed plenty of believable growth in the novel, though I’m hoping for much more ‘tempering’ for him in the next book – he goes through a lot, but doesn’t ever seem to really be in danger. Comparing this novel to what we’ve experienced in A Song of Ice and Fire is slightly unfair but entirely warranted – it’s a novel that focuses on the characters, their motivations, their inner-most thoughts and experiences, with the world brought in to give us the sense of ‘place’ and ‘time’ to ground them. The characters react realistically, making believable choices (whether those choices fall on one side of the fence or the other), and as such it’s Epic Fantasy that readers of A Song of Ice and Fire will enjoy. There’s plenty of action (human versus giant, human vs human), plenty of cool surprises, and places where I had to stop reading to digest what had happened – mostly because I felt that I knew the characters and had to agonize over some of their choices, which means I cared about them. 🙂 This is where the novel’s strength shines through – the characters and their interactions with each other. Some of the action scenes feature creatures who seem a bit too easy to defeat, or the presence is predictable, but the characters carry the novel through. All things considered, this is an excellent debut, showing that John has an eye and heart for characters; the world should continue to evolve and broaden in the next book, and I can see a massive confrontation on the horizon, with both sides believing without a doubt that they are both right, or doing the right thing. Definitely recommended – a promising start to what should be an excellent Epic Fantasy series! To order your copies of Malice, click here for Amazon US (hardcover and ebook), Amazon UK (hardcover and ebook), and Exclusive Books (hardcover). Check out John Gwynne’s webpage here!